I’ll go straight to the meat of this game and point out its strengths and weaknesses in terms of gameplay. 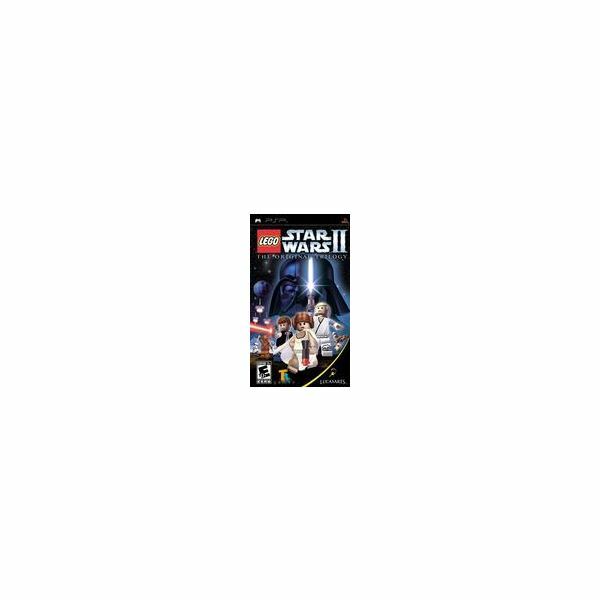 Lego Star Wars 2 offers tons of features, side-quests, funny twists on the Star Wars storyline, few difficult puzzles, game hallmarks to achieve and massive number of replayability. You take control of specific Star Wars characters depending on which chapter in the trilogy you are. There are tons of characters coming from the three classic Star Wars episodes which you can have the chance to play as you progress on the game. And if you are a Star Wars fan you’d know which characters you would be able to play in each of the episodes. When you fire up the game for the first time, you can will be given with two sets of characters and the different chapters in the Star Wars Trilogy to play. All three Star Wars episodes can be play immediately after you fire up the game for the first time. And you don’t have to play the episodes in any sequential order. Once you start playing a particular episode, you need to complete various stages before you can move on to the next episode without going back to the main menu. Before the end of each episodes you would need to beat a certain level boss. These level bosses are very easy to beat and you should not have a problem in finishing them off, although some levels would require certain strategy by which you can beat the boss. And don’t worry about getting stuck with a difficult boss, since there is actually no boss in this game which is hard to beat. In the game, if you run out character lives, you character would dissolve into various pieces of Lego. Immediate after however, you are back again in your usual form. And you can die for as much as you want and your current game will never reset from the start.Besides, like I said the enemies are very easy to beat. Beating the bosses is not the only easy thing to do. Some of the games puzzles would require you no more than 1 minute to solve. Easy but otherwise fun to complete. The fun part of the gameplay is the assembling of Lego blocks to form a structure which you will need for the game or to simply smash it to gain coins, heart lives and many more goodies. In fact a hidden chapter of the game's three episodes requires you to collect gold Lego parts which you can assemble into something required before you can progress into the level. This game features all of the characters in the three original Star Wars episodes. You can play C3P0, R2-D2, Princess Leia, Han Solo, Luke Skywalker and even master Yoda. Each of these characters either shoots guns or wields their light sabres to attack enemies. Luke, Master Yoda and Darth Vader, being Jedi Knights are the ones who can use the light sabre as a weapon, while Luke prior, to being a Jedi apprentice, uses a gun to attack enemies as well as the other characters such as Princess Leia and Han Solo and even Chewbacca. Lego Star Wars 2 is a Lego-inspired game, so expect the characters to be rendered in a blocky manner. However, you won't mind it a bit since they are supposed to be Lego parts anyway. Besides, seeing our favorite Star Wars Trilogy characters is simply fun and enjoyable. A great aspect of the aspect lies in the rendering of the environment. The game’s graphics were able to give justice to the Star Wars Universe. Star Wars fans would certainly be delighted to be able to roam around their favorite areas in the whole of the Star Wars Trilogy including the memorable spaceships and places where their characters can interact with. Sound quality of this game is top-notch as well. From the firing of Luke’s spacecraft to the sound of the light sabre and the bustling of storm trooper guns to the opening and closing of doors inside the Enterprise – overall the game sound effects is enough to make you play and like this game. Lego Star Wars 2 is definitely a great game which will be very much enjoyed by both Lego and Star Wars fans. Its simple and yet rich gameplay and the game’s degree of difficulty are enough to make you play the game over and over again to achieve 100% completion. This game is one of the funniest game the PSP could ever have.